We found out last week that the company we work for, Antarctic Support Associates, lost the bid to the National Science Foundation to continue working down here. The company that was awarded the bid was Raytheon. It shouldn't really affect most of us who are in the trades, or the scientists. It mostly affects the management staff. It will be interesting to see what happens. Raytheon will not take over until sometime in April I believe. And I just heard that ASA is contesting the decision, so we will see what happens. We have had a lot of snow this week, but that alternates with blue skies and relatively warm temperatures. I really like the snow, but it doesn't last too long when the sun comes out. The ground here is made up of very black rocks which heat up when the sun comes out and melts the snow. So even when the temperatures are below freezing we have mud and water in the streets. 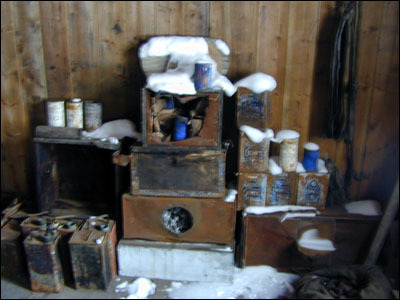 Some of the worst storms we get here in McMurdo are called "Herbies." These are storms which come out of the south and can bring winds in excess of 100 m.p.h. They can come up without much warning. We had a mild herbie earlier this week with winds hitting 70 m.p.h. and the visibility dropping to about 100 yards. The temperatures have really been nice, but the wind–chill is terribly unpleasant. Antarctica is the coldest, driest, highest and windiest continent on earth. One reason that the temperatures are so low here is the low angle of the sun. Even though the sun is up 24 hours a day, it never gets very high in the sky. Being at such a low angle not much heat makes it here, and it has more atmosphere to penetrate. Another factor is that snow, being white, reflects a lot of the light back up into the sky. It gets far colder here than it does in the Arctic at the North Pole. The North Pole and the Arctic is an ocean, while Antarctica is a real continent. Water retains energy better than a land mass, so the water absorbs warmth during summer months, stores it, and then moderates the temperatures during the winter months. The huge land mass of the Antarctic continent does not store heat. In addition, surrounding the continent there is a current called the Antarctic Circumpolar Current. This essentially isolates the continent by not allowing warmer waters from the north to reach the continent. One of the strange things about being here is that once you are just a little bit out of town you almost feel as though some of your senses aren't working. First of all it is extremely quiet. When the wind is still, there is no sound except for your own breathing and your footsteps on the snow — which I find to be amazingly loud. Visually there is white (the snow), black (from the few rocks and nearby mountains) and blue (the distant mountains, the sky and the ice). That is it. There is also no movement — no trees to sway in the breeze, no animals or birds around. And of course there is nothing to smell. It is rather strange. As you can imagine, it was very nice to see the first Skua birds of the season. We have seen two so far. These look very similar to seagulls, but are somewhat darker. They are scavengers and will eat just about anything. I saw one pick up a frozen hot dog someone had dropped and swallow it whole without much trouble at all. It is fun to see birds again. The skies have been so empty except for clouds. These birds seem totally unafraid of humans and will fly down and steal food right out of your hands if they see you have it. They know where the galley is and seem to check on everyone coming out of it. 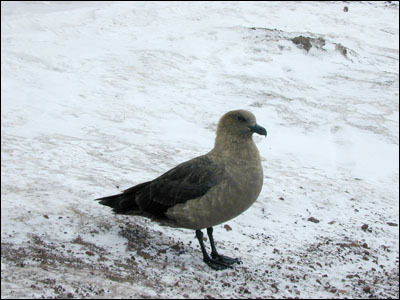 I came out carrying a small package the other day and one of the skuas flew down right in front of me until he could see that what I had wasn't food. It's kind of fun. From what I hear they really become pests by the end of the season. An interesting event happened yesterday. 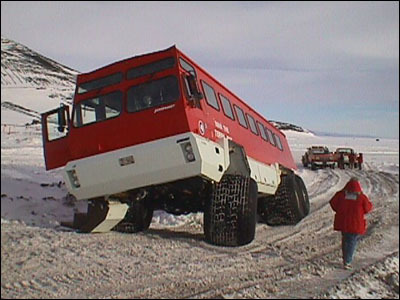 We have a very large–wheeled vehicle here to transport people to and from the ice runway. 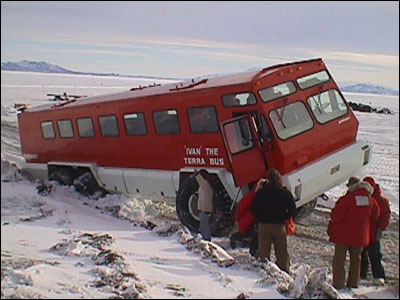 It is called Ivan the Terra Bus (most of the vehicles around here are named). Well, yesterday as it was coming in from the ice runway, it hit a bad spot in the ice and the ice cracked. One of the rear wheels slipped into the water and Ivan was trapped there for quite some time. Of course they got it out and then repaired the hole in the ice. Most interesting. At work our department, which includes electrical, plumbing, sheet metal workers, welders, linemen, pipe–fitters, etc., threw a huge party for the entire base. I could not imagine throwing a party for 800 to 1000 people, but we did it. We spent all day cleaning, decorating, cooking, etc. You cannot imagine the amount of food we had. 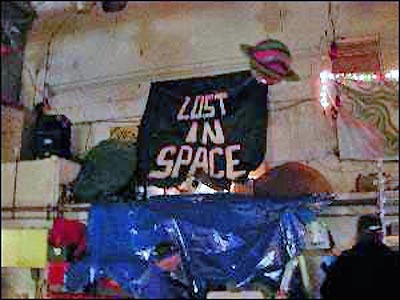 The theme of the party was "Lost in Space" so all the decorations were aliens, space ships, planets, etc. 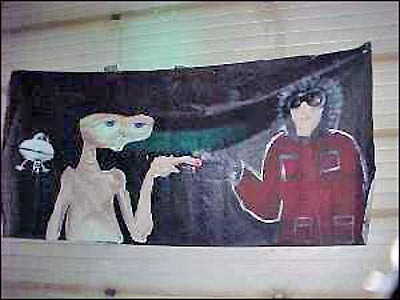 Most of the aliens were dressed up to represent Raytheon employees. 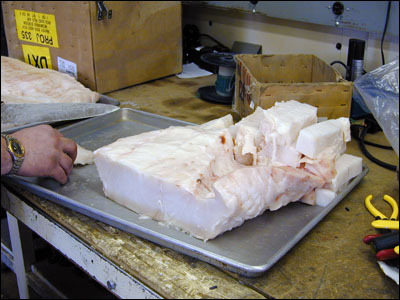 We had 300 pounds of Antarctic Cod (some of which is shown below). I am going to be really sad to not have more of that wonderful stuff when I leave here. It is such a delicious fish. And a huge fish. I will try to go to the aquarium one day soon and photograph some of them. We grilled some of the cod and battered and fried the rest. We also had 4 large pork roasts, about 100 pounds of steaks, 75 pounds of chicken wings, potato salad, huge pots of pinto beans, and of course chips and salsa, etc. I started cutting up onions, garlic and carrots for the beans around 7:30 in the morning. Then I cut up the chicken wings and fish. It was a huge job. 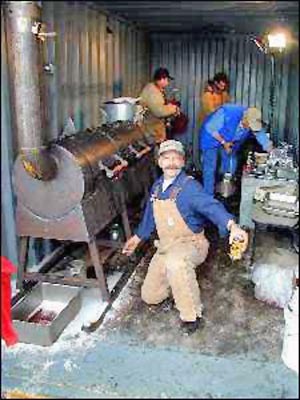 One of the pipe–fitters/welders had made a huge smoker. We also had two huge grills for the rest of the meat. It was amazing to see that we could feed all those people, but then the galley does it every day. 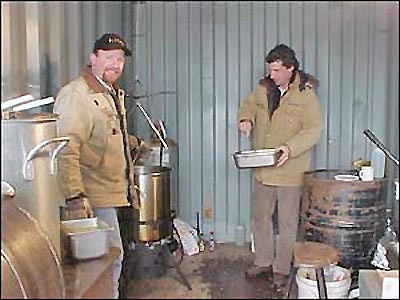 We had $2000.00 worth of alcohol for the party. 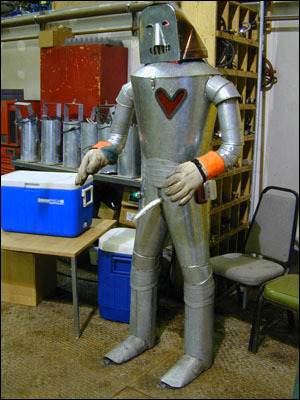 Someone made a larger than life sized aluminum robot that they called the Tin Man. He had lights and buttons and was the dispenser for the Margaritas. He was anatomically correct and I'll let you figure out how the drinks were dispensed. We also had cases and cases of beer. At the end of the night we still had some food left, but no alcohol! One of the things I like best about McMurdo is that everyone here is equal. This is truly a classless society. Everyone accepts everyone for who they are. There are no status symbols. We all dress similarly because most of our clothes were issued by the CDC. Most everyone wears either a red parka or a tan Carhartt jacket. There are no fancy cars and no fancy houses. We all live the same, eat the same, etc. You never can tell just who the people are you are talking to. Many people want to come here and will take any job they can get just for the opportunity. I know an archeologist who is working as a janitor, a doctor who is working in housing. There aren't any pretenses anywhere. It's quite a comfortable feeling. 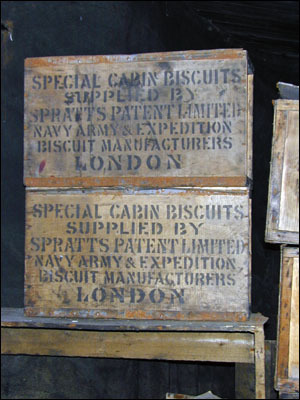 One of the huts built by Robert Falcon Scott in 1902 is very near McMurdo and is called Discovery Hut, named for his ship. It is about a 5 minute walk from our dorms. It stays locked so you can generally only look at the outside. This morning the Historical Society got the key and we were allowed to go in. It is not a very big place. It was prefabricated in Australia using an Australian design and assembled in New Zealand, then disassembled to be brought here. 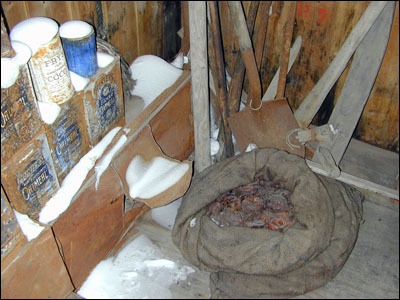 They had great difficulty in maintaining a comfortable temperature inside and ended up not using it for accommodation, but more to store supplies. Later expeditions in 1908 and again in 1915–16 made more extensive use of the building. It is an interesting place because it has been left exactly as the early explorers left it. 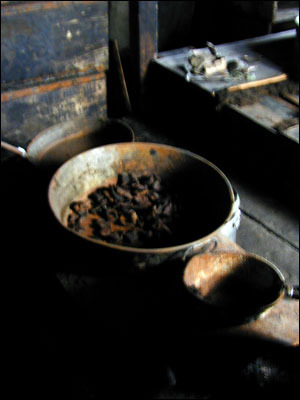 There is even some seal blubber still in a skillet, like they only just left and will be coming home soon to eat. 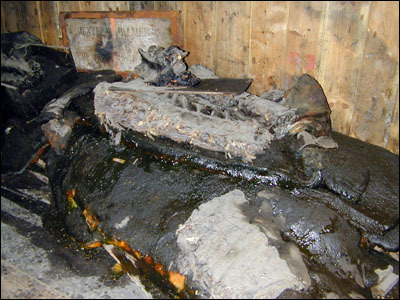 Everything is well preserved because of the cold, even though it has been almost 100 years. 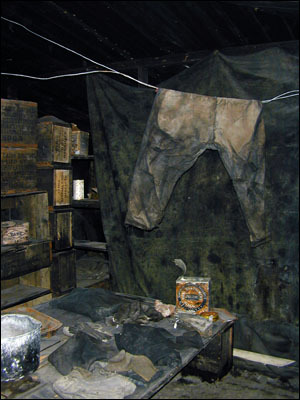 During one of the later expeditions in mid–1916 the place was half–filled with snow. The party was low on fuel and occupied only a small corner of the building. It was so cold inside the hut and spirits were so low from lack of warmth and food, that no one made the effort to clear out the snow. Had they done so they would have found provisions of food which are still there today. 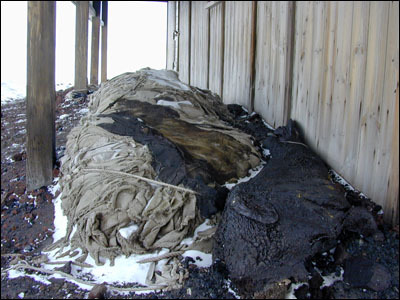 There were even piles of seal blubber remaining which could have been used for fuel. Outside the hut is the carcass of a seal which has petrified in the arid, cold climate. The human history of Antarctica is unique in that it is so young. Almost all of the original structures ever built here still survive. 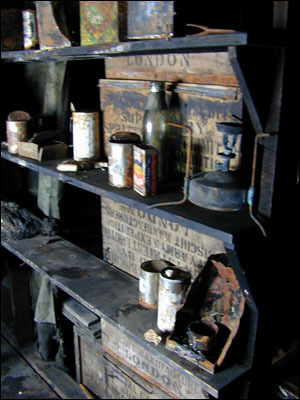 The Antarctic Heritage Trust is a group set up to preserve those early buildings from the 'heroic era.' Unfortunately not much has been done to preserve the history since that era. That is the goal of the McMurdo Historical Society. We are trying to design a web page to generate some interest, in particular from people who have been here before, in the hopes of finding stories and facts that haven't been recorded.